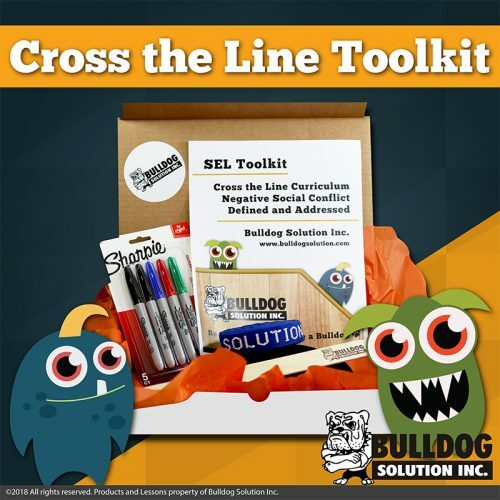 This activity is a great way to create awareness around bullying, racism, sexism, and address negative behaviors such as drama. Using this activity as a great initial step to open the discussion to address these issues and come to solution to build a positive school climate. There are many different versions of Cross the Line. We recommend teachers create their own statements to address the issues happening in their school. Below is a sample of the activity. This activity is meant to bring up emotions and understand the importance of connection, diversity, and inclusion. We are never alone in how we feel. It is important to process the emotions and past experiences, so student can learn from the activity and put closure to what might have happened to them (drama, bullying, neglect, racism, or abuse). 1-Analyze factors that create stress or motivate successful performance. 2-Recognize individual and group similarities and differences. 4-Define unhealthy peer pressure and evaluate strategies for resisting it. 5-Understand how individual, social, and cultural differences may increase vulnerability to bullying and identify ways to address it. This activity requires students to be aware of their own experiences as well as the group’s commonalities in experiences. Cross the line if you can relate to the statement read by me. When I say reset you return back behind the line. If you don’t identify with the statement you do not cross the line. If you feel exposed or you are not comfortable to cross the line please stay in your position. If you feel brave and want to take a risk as well as relate to the statement read by me, cross the line. Please do not giggle, point, or laugh. Don’t point or force your peers to cross the line. This activity is about you and not your peers. Be honest with yourself. Cross the line if people routinely mispronounce your name. Cross the line if you have ever been blamed for something you did not do. Cross the line if you have ever been teased about your accent or your voice. Cross the line if you have intentionally hurt someone’s feelings. Cross the line if you often feel misunderstood. Cross the line if you have been disinvited or uninvited from a party. Cross the line if you have ever been excluded from a group. Cross the line if your friends have ever turned on you. Cross the line if you’ve ever been teased. Cross the line if you or anyone in your family or a friend has a disability. Cross the line if you’ve ever been teased because of your religious background. Cross the line if you have ever been teased because of where you live. Cross the line if you’ve ever been told you shouldn’t cry or show your emotions. Cross the line if you have ever been judged because of the color of your skin. Cross the line if you even been the only one of your race or ethnicity in a group. Cross the line if you’ve ever stood by and watched while someone was hurt and said or did nothing because you were too afraid or didn’t know what to do. Cross the line if you have been roasted. Cross the line if you have roasted someone. Cross the line if you have been or seen someone roasted and it went too far. Cross the line if you sometimes feel like you don’t fit in. Debriefing: Facilitate a discussion about what they experienced, then a discussion that transfers back to the students interacting with each other. What did you want to remember about what we’ve just experienced? What did you learn about your peers? How can you use this experience to help with drama and bullying? How can we use this activity and stop racism? How can we help our friends or classmates with teasing, roasting, bullying, and racism?